You are currently browsing the category archive for the ‘wine’ category. This month’s Hot Edition glass is perfect for sipping cool, refreshing wine on a Summer night with friends. Pick yours up for $10, along with a passport, at the check-in table located outside Kettle Art, 2650-B Main, and embark on your Sip & Shop tour while enjoying wine samplings at each participating venue. Have your passport stamped at five or more destinations, and enter for a chance to win gift certificates at the drawing held at the check-in table immediately following the event. As Kettle’s Summer Salon comes to an end, Kettle comes out in full force during the month of September with plenty to do & see! Kettle Art Gallery joins forces with the Dallas chapter of American Society of Media Photographers in hosting a one weekend only, exhibition of photography professors in North Texas. This show is curated by Jason Janik. 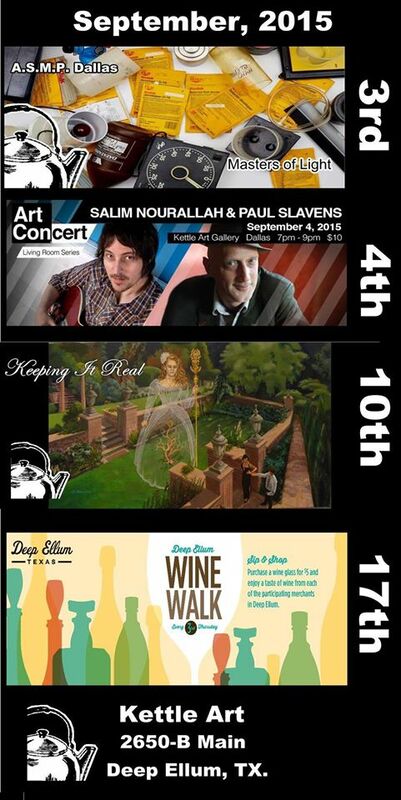 Salim Nourallah & Paul Slavens will play the fifth event in Art Conspiracy’s series Art Con(cert) series, which features local musicians performing in unique and intimate living room style spaces. Salim & Paul have a long history working in the music business together and entertaining local audiences with their ingenuity. They’ll demonstrate their cleverness on this evening by performing a song swap that is sure to be one heck of a good time. Street Parking and surface level lots are available throughout Deep Ellum. Download the Pay By Phone app for metered parking. If a Beatle was left in the desert at age 3 and raised in El Paso, Texas, you’d have Salim Nourallah. Salim is a North Texas music scene fixture. After gaining initial acclaim with the Denton-based Nourallah Brothers he’s gone on to release a half dozen solo albums and produce a fine list of many others (including the Old 97s, Rhett Miller, Deathray Davies & the Damnwells). His solo debut Polaroid (2004) was met with reviews like this one:“discovering a singer-songwriter who can stop time is rare, but Salim Nourallah is such a find…” (Rolling Stone). Beautiful Noise followed in 2006 to more critical acclaim and Salim swept the Dallas Observer music awards with Best Album/Best Song and Best Producer. Salim went on to win 7 consecutive Observer Awards for Best Producer. His 5th solo cd, Hit Parade, was released in April 2012 by the German indie label, Tapete Records. Hit Parade garnered more favorable press like “Coupling catchy rock with mature but not old lyrics, Nourallah has assembled the best album of his career…” Salim’s most recent full-length record, Skeleton Closet, is slated for release later this year. Paul Slavens is well known in the North Texas area for his work as a multi-instrumentalist with bands like Ten Hands, the Baptist Generals and The Travoltas. He also frequently performs an Improvisational Musical Comedy show and won the 2011 Dallas Observer Music Award for Best Jazz Act, and the 2013 and 2014 Award for best Keyboardist. Paul is also well known for his radio program “The Paul Slavens Show” on KXT. He began doing his show on KERA in 2004 and the program has received awards from the Dallas Observer in 2008, 2009 and 2010 and has been nominated every year since 2005 for Dallas Observer Music Awards. As a composer his works have been performed at Museums in Dallas and Fort Worth, The McKinney Ave. Contemporary, and The Wylee Theater and the Grapevine Palace Theater. Art Conspiracy is a nonprofit community that conspires to bring artists and musicians together, raise funds, and activate awareness for regional creative programs and causes. Since 2005, ArtCon has raised more than $275,000 for beneficiaries across the Dallas-Fort Worth area. Consider becoming a Donor today to help us grow our mission. Visit ArtConspiracy.org for more information. This month’s glass is perfect for sipping cool, refreshing wine on a fine September night with friends.